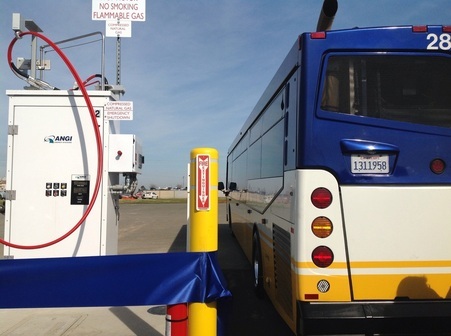 On February 22nd, Sacramento Regional Transit (Sac RT) held a ribbon cutting ceremony for its state-of-the-art compressed natural gas (CNG) fuel station at its new bus maintenance facility located in the McClellan Business Park. The fuel infrastructure addition marks Sac RT’s second CNG station since they constructed CNG infrastructure at their 29th Street facility in 1993 for their initial CNG buses, and the first time that their CNG infrastructure will be available to the public. The public access element of the new CNG facility is the result of collaboration between Sac RT and the McClellan Business Park. They hope that CNG infrastructure availability will be a draw for fleets and businesses considering the park as a potential place to locate. This partnership will soon extend to Sac RT’s original 29th Street maintenance facility, where CNG will be available to the public in April. Fuel availability is key to making CNG a tenable option for fleets, which underscores the importance of Sac RT’s stations being public access. Sacramento Regional Transit has fully transitioned its large transit bus fleet to CNG, with the intention of moving to CNG for smaller shuttle buses that are used for Neighborhood Ride and other services. The biggest motivator for the new maintenance and fuel facility was operational efficiency, particularly given Sac RT’s increasingly high use of CNG. 125 buses will be served at the new facility with a future potential to double this number. The CNG fuel pumps can fill four vehicles simultaneously in less than six minutes. The case for Sacramento Regional Transit’s move to CNG is as much about economics as it is about the environment. Sac RT estimates that CNG allows them to save $8 million annually in fuel costs. Natural gas buses reduce greenhouse gas emissions, and at the scale of Sac RT’s fuel consumption, the impact is significant.